When parents learn that their child has special needs, they begin a journey filled with strong emotion, difficult choices, and an ongoing need for information and support. Parents may feel isolated and alone, not knowing where to begin their search for information and understanding. This website offers free support resources for families with special needs. Take a tour or use the search box to quickly find free guidance and support resources. This website is dedicated to my oldest daughter Monica who was born with multiple disabilities (cortical blindness and seizure disorder) and microcephaly due to an occipital encephalocele and Chiari malformation. She has a genetic kidney disease called PKD as well as hand and arm deformities from Amniotic Band Syndrome. 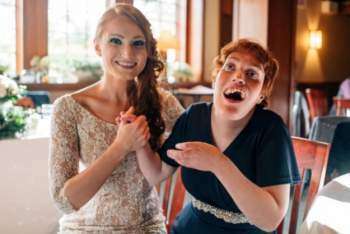 Despite numerous developmental disabilities, she is a delightful, motivated and affectionate young lady who continues to learn new skills and novel ways to enjoy life. See Monica's page and her Youtube channel.